AKG unveils new Y-Series headphones | What Hi-Fi? 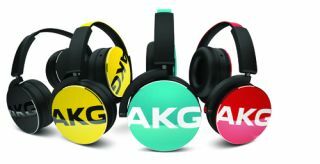 AKG has unveiled its new Y-Series headphone range, which marks the latest addition to its lifestyle collection. The seven-strong range is part of the company’s efforts to renew its offering – which until now predominantly consisted of the reputable K Series. The Y-Series includes three in-ear and four on-ear models ranging from £10 to £130, all of which are expected to hit UK and European shelves by the end of this month. AKG used the official Y-Series launch in Berlin to shout about the mid-ranging Y50 on-ears (pictured), which will retail at £80. Their head-turning design comes in four colours (teal, yellow, red and black) and features aluminium earcups, leather ear pads, and a stainless steel headband. In line with the rest of the range’s on-ear models, the Y50s have a closed-back design; fold flat thanks to a 3D-axis mechanism; and come with a detachable in-line mic and remote cable for use with a smartphone. The on-ear models also have 40mm drivers. Next down in the range’s on-ear models are the smaller-cupped Y40s, which continue the Series’ colourful theme. Available in blue, yellow and black, they cost £70. The model has a wireless version, the Y45BT, that features aptX Bluetooth with NFC for one-touch pairing. They claim to have 8 hours of cable-free use, though a detachable cable is supplied for direct listening when the battery runs out. They come in two colours this time – white with a beige trim and black with a white trim – and are priced at £130. The Y55DJs are the range-toppers at £100 and the largest model in the Y-Series. Available in blue, red, black and white, they are entry-level DJ headphones, which AKG claim to have been built to DJ specs and designed to produce an enriched bass. The Y-Series’ in-ear models have a semi-open design, and start with the Y10s (available in white, teal or brown for £10). Next up are the Y15 earbuds, which come with a carrying pouch and are available in black, white or iris (blue) for £17. The higher-tiered Y16s – available in standard black of white for £25 – also have a carrying pouch included, and feature a one-button mic and remote control for use with smartphones. And that’s the lot. We’ll be getting review samples of the Y-Series headphones soon, so keep a look out for our verdicts. During a fifteen-minute hands-on demo with the Y50s, they were comfortable to wear thanks to thick spongy earpads and a well-cushioned headband, and produced a clear, punchy sound – though we only heard bassy pop music and, of course, we’ll put them through more rigorous testing in our upcoming review. In the meantime, we’ll be keeping you up-to-date with the latest news on AKG’s developing collection as the Y-Series isn’t the only thing brewing in its pot. A higher-end, technology-driven headphone collection, called the N Series, is set to launch next year, with first looks perhaps as early as CES.